The entire Delaware Valley is under a severe thunderstorm watch until 10 PM this evening as a couple of lines of thunderstorms to our west are moving towards the region. The watch works in tandem with one to our west over Central Pennsylvania until 8 PM. There are two lines of activity that are moving east, with some cells moving northeast within the line's general eastward movement. The first line is developing from near Lancaster southwest into Maryland, with the second and stronger line across Central Pennsylvania. Both of these lines will push east over the next several hours. Given the setup with the lines out to our west, the activity that's approaching Chester County now will move through over the next couple of hours. Notice that it's not as solid a line as the stuff to our west...some spots do get hit a bit harder than others this evening. With the first batch, that could be the city's best chance at getting stronger or severe storms...and if they hold together they should move on through after 5:30 PM. Line one should ride along and south of the Turnpike. It doesn't appear this line will build much to the north of there as it moves east. The line back west of Harrisburg may not make it to Philly until 8 PM...and if this first line holds together the second line may weaken a bit before moving through. 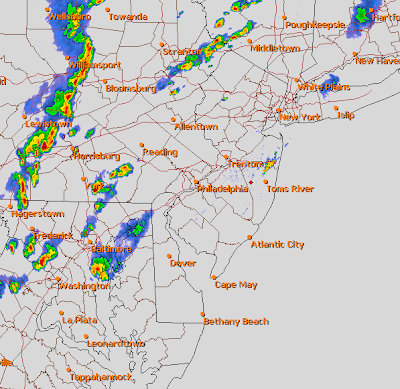 This line will probably be stronger for areas to our north -- Allentown, Reading, Quakertown may see stronger storms and more of an impact from this as it moves on through later this evening. The bigger threat with today's storms is heavy rain -- there have been some flash flood warnings earlier to our north from storms that fired up this morning. The threat of heavy rain may be a bit localized since storms are moving at some clip...but with the humid airmass in place the potential for some soaking storms does exist. Basically, this means a couple of rounds of storms locally can't be ruled out -- but it's not going to be a constant stormy night. We'll get a round for 30 minutes, break, then perhaps that second round to our west. Farther north, the line farther west may be the one that matters.